Every summer Kevin Gordon leads guided walks around Lewes. In this talk he gives an opportunity to take a stroll around the town without the need to climb any hills! This virtual tour includes four graveyards (All Saints, the Quaker churchyard, St John sub Castro and St Michael’s) where Kevin will point out some headstones of interest and talk about the etiquette of death. We will also visit one of the town’s twittens where he explains the tell-tale architectural features which show how rich the original owner was. Along the way we’ll meet a few Lewes characters, such as X-it the dwarf who made his living in a most extraordinary way and local school teacher and guardian of Lewes virtues, Kate Fowler Tutt. LHG memberships fall due for renewal on 1 January 2015. You will be able to renew at the October, November, December and January meetings, where new membership cards will be waiting for you. Fees are unchanged at £8 for the first member and £4 each for others at the same address. In addition to the Cinema de Luxe on School Hill and the Odeon on Cliffe High Street, there was once a third cinema in Lewes. It was the County Theatre, in Watergate Lane. There is a photograph in Bob Cairns’ ‘Lewes through Time’ that shows three uniformed commissionaires standing outside. It closed in the late 1920s and was later used by an amateur theatre group formed in 1929 called the Lewes Players (who later became the Lewes Theatre Club). It was subject to a compulsory purchase order in 1936 and was demolished to allow the County Council to add the council chamber to Pelham House. It was also called St Michael’s Church Hall. Additional source: Archives of the Lewes Theatre Club, ESRO/LTC. The 4 January 1840 Sussex Agricultural Express noted that Mr John Hillman of Cliffe (1780-1864) had resigned the business of lime burner, coal merchant, etc, that he had carried on for many years, in favour of his sons Thomas (1810-1856) and Robert (1816-1884) Hillman. 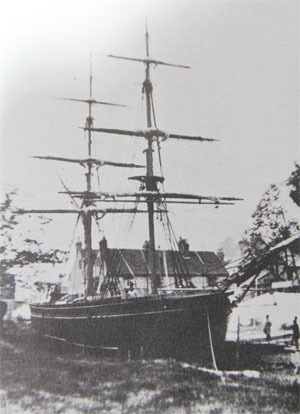 John Hillman senior, from a long-established Cliffe family, was reportedly a self-made man as a corn, coal and lime merchant, a ship-owner and a farmer, and was at this time progressively handing over different areas of his business to his various sons. Two others, John junior (1812-1889) and Alfred (1825-1887), owned and managed the Southdown Brewery, Thomas Street, Cliffe. Only his eldest son, Alexander (1808-1863), left the town to pursue his interests elsewhere. Two of John Hillman’s daughters had married professional men in the town, veterinary surgeon John Grover and doctor George Scrase. John Hillman senior, his sons and his sons-in-law were all active in the town’s trade, and also in its Conservative Association, supporting the protection of agriculture by the Corn Laws. After his retirement John Hillman senior continued to live in the Cliffe until his death. John senior, Thomas and John junior farmed the Gote Farm, Ringmer, in partnership from 1833-1840, when they were given notice to quit. They were successful stockbreeders, winning prizes for their Southdown sheep and their cattle in local shows, but the Glyndebourne Estate agents felt that as farmers and corn-merchants they focused too much on wheat, not properly rotating their crops, and leaving the daily management too much in the hands of their bailiff. John Hillman junior, who lived at Gote Farm for some years, moved on to Landport Farm. Then from 1855 to after 1871 he lived at Lower Stoneham Farm, South Malling, which he farmed in partnership with his brother Alfred. In 1874 he sold his interests in the brewery to Alfred, and at about the same date retired to Wallands Crescent. The Southdown Brewery was owned by Alfred Hillman and then his son Bernard until finally sold in 1895. After Thomas Hillman’s death in 1856, his brother Robert Hillman ran the South Malling chalkpits and lime kilns, until his own death in 1884. The 1881 census notes that he and his daughters lived at 104 High Street, in St Anne’s parish, and described him as a lime and coal merchant employing 60 labourers. However, his only son died young, so he had only his five daughters to succeed him. John Hillman senior was buried at Cliffe, presumably in the graveyard extension that he had himself sold to the church trustees, but his sons Thomas, John and Alfred, and many of their families, have memorials in South Malling cemetery. An election-time dispute at the Star Inn (the Tory headquarters) rumbled on to culminate in a court case reported in the 30 July 1842 Sussex Express. Mr John Hillman, coal merchant, brewer and farmer, his son Thomas Hillman and his son-in-law, veterinary surgeon John Grover, were accused of having assaulted a Mr Harvey. It was alleged that Thomas Hillman and John Grover had held Harvey’s arms, enabling John Hillman to strike him, cutting his eye and leaving him with a bloodied face. The motive was alleged to be that Harvey had ‘turned his coat’ from the Tories. Thomas Berry gave evidence that immediately after the event Harvey had retailed the story to him, but there was no other first-hand evidence to support the victim against the accused men’s denials, so the verdict went in favour of the Hillman party. It isn’t clear whether this Mr Harvey was of the rival brewery, but Thomas Berry (coal and wine merchant, later a brewer, but also a non-conformist and a Liberal) was both a business and a political rival of the Hillmans. The big political issue at this date was the Corn Laws, over which the interests of a brewer and a farmer might be expected to clash. The Tory party was in turmoil about this issue, with the free-trader Robert Peel leading an administration committed to their retention. We know from other sources that John Hillman and his family were leading figures amongst the town’s protectionists. This was an issue over which feelings ran very high. In the first week of February 1863 the Sussex Express and other newspapers across the nation carried brief reports of the death of William Gresham Wiles, a brewer of the firm of Gresham Wiles & Brown of South Malling, or Cliffe, or Malling Street, Lewes (in different reports), who had been found drowned in a tun of beer on the previous Friday afternoon. He had been talking to some of his men, and had then gone upstairs to skim. It was conjectured that he had fallen into the tun while doing so. The inquest, held the same afternoon, concluded that he had perhaps been overcome by carbon dioxide. The 1861 census finds the household of William G. Wiles, a brewer, wine and spirit merchant employing 3 men and 3 boys, at the Cliff Brewery in South Malling parish, entered on North Street, immediately before the Tanners Arms. He was aged 26 and a native of St Neots, Huntingdonshire. His household comprised his young wife, his widowed mother (described as a ‘proprietor of houses’) and a teenage servant. Leslie Davey’s book ‘The Inns of Lewes, Past and Present’ identifies the Tanners Arms (named after Baxter’s tannery across the road and later called the Brewery Tap) as at no.135 Malling Street, between the Wheatsheaf at no.123 and the Prince of Wales at no.163. 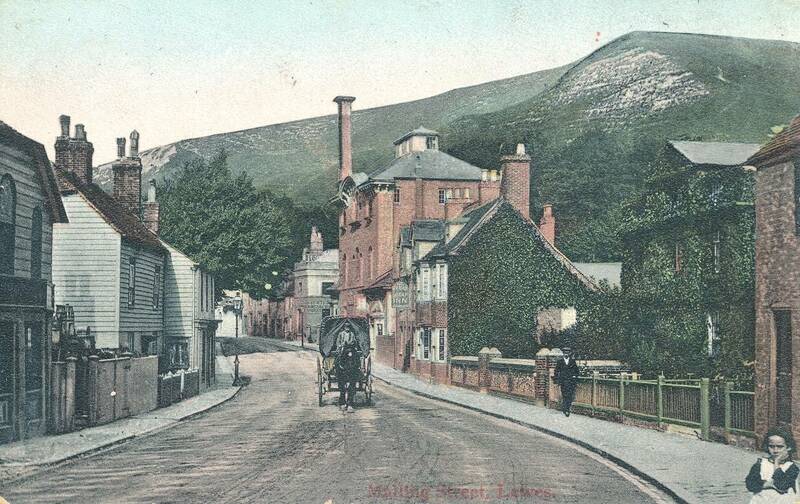 This identifies his brewery as that later called the South Malling Brewery on Malling Street. By 1867 Alexander Elmsley, brewer, maltster, wine & spirit merchant, and agent for Bass’s and Allsopp’s pale ales and Guinness’s stout, was proprietor of the Cliffe brewery, Malling Street. The 9 April 1904 Sussex Express noted that the freehold property known as the South Malling Brewery, with a 66 foot frontage to Malling Street and an overall area of 1,165 square feet, was to be sold by auction on Tuesday 19 April 1904. The Edwardian postcard below shows it bearing the sign of the ‘County Town Mineral Water Works’. While these were the only schools listed in the main Lewes section of the directory, there were many other schoolteachers listed in its commercial section. The seminaries mentioned are private schools for young Iadies – post-Reformation Lewes was never a centre of education for the priesthood, and that type of seminary would not have had a female head. I particularly liked the ‘Trusted & Speciall’ establishment. This entry was posted in Agricultural History, Cultural History, Economic History, Education History, Family History, Lewes, Local History, Social History, Transport History. Bookmark the permalink.